Prepare to match wits with the most ingenious robbery of the year! Hardened criminal Gully Mercer (Mick Rossi) devises a foolproof plan for a snowy New Year s Eve heist at 2:22 A.M. at The Grange, a high-class hotel filled with a vault of valuable safety deposit boxes. 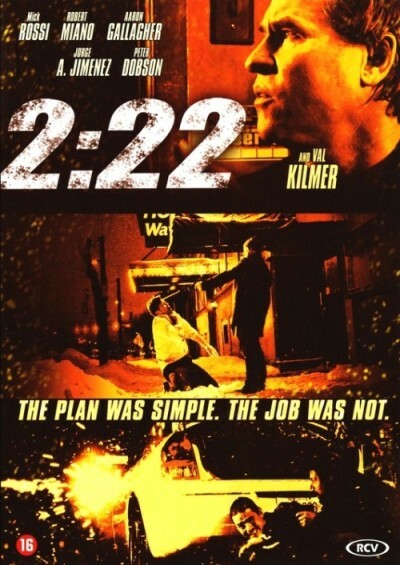 Aided by a brilliant and eccentric jewelry mover (Heat s Val Kilmer) and three fellow thieves from his usual crew, the scheme involves tying up and impersonating the night staff except the hotel s demanding guests cause plenty of complications, including a frustrated drug dealer who starts making demands of his own. Soon their paths take unexpected turns as seemingly small mistakes lead to treachery, pursuit, and murder. Also featuring Robert Miano (Fast & Furious), Peter Dobson (Lakeshore Drive), and Bruce Kirby (Crash), this stylish, pulse-pounding thriller delivers powerful performances and one riveting twist on top of another.